Just saw a cool informal talk from Andreas Burkhalter about the mouse visual cortex. 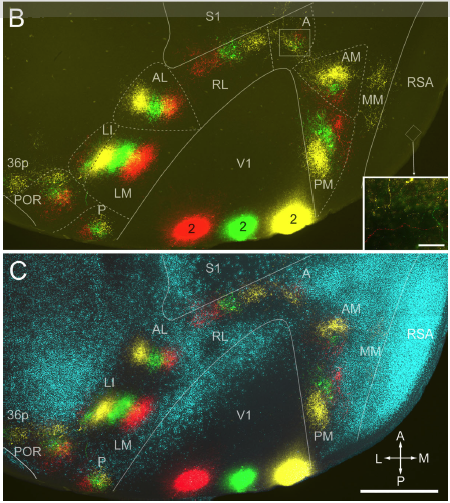 He has a fascinating paper, Area Map of Mouse Visual Cortex, in the Journal of Comparative Neurology, in which he identifies not just three or four areas of mouse visual cortex, but twelve! Each area has a complete map of the entire visual field. He combines triplet injections of Di-I, Di-O and BDA as fiducial markers with a label for callosal connections. He fixes the tissue in a manner that allows the unrolling and flattening of the entire mouse cortex. This allows him to segment and show the orientation of each field in a single cortical layer in the same slice. Different layers give different patterns of projection. Given the richness of the data obtained, I’m surprised that more systems neuroscientists don’t use identical techniques. He has also created a wiring diagram of each of these and shown that receptive field size increases with the depth in the visual system hierarchy. He also noted that although Michael Stryker finds 50% of visual cortex neurons are direction selection (when stimulated by drifting gratings), he finds only 10% are direction selective when using random dot patterns. Presumably, drifting gratings provide additional cues beyond direction of motion that confound analysis. For such a ‘blind’ creature, mice sure have a complex pattern of circuitry to process visual information.